Weber and Broil King are among the biggest names and also among the oldest brands in the grill making industry. In this Broil King vs. Weber comparison guide, we detail all you need to know about these grills and helping you make a decision on which of these grills will give you better performance and experience. We’ll be comparing six of the best-selling grills with the same caliber from both Weber and Broil King (3 grills from each brand compared side by side). Before delving into the comparison, here is an overview of the two brands. Weber is arguably the most popular brand in the entire grilling industry and it’s all for the good reasons. They have been making grills since the early 1950s and their legacy in making high quality and reliable grills is evidenced throughout the years. With lots of grills designs from small ones to large ones, there is a variety to choose from. They come in two popular series, Spirit and Genesis differentiated by the structuring, technologies and specifications. The history of Broil King dates back to the early 1900s and just like Weber, it has grown to become one of the most loved and trusted brands. Although they are not as popular as Weber, the grills they make have stood the test of time and are definitely worth having in your backyard. If you are looking to pick one large sized grill from either Weber or Broil King and need a breakdown on the best from the two brands then it has to be Weber Genesis II LX S-340 and Broil King Regal 490. 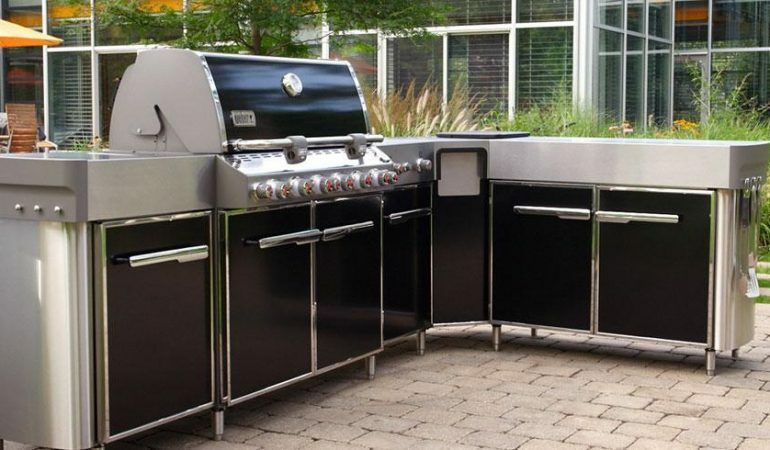 If you are looking to compare Weber and Broil King’s large sized grills, then here is the breakdown of two large sized grills, with higher grilling space and BTUs. The Weber Genesis II LX S-340 is among the best-selling in the Weber genesis series and equally the Broil King Regal 490 is among Broil king’s most loved grill. They are big in size grills and below is how the two grills compare. If you are shopping for larger grills that have high BTUs and larger coking area, here is a comparison of the two best you can get from the two brands. The main cooking area of the Weber Genesis II LX S-340 is 513 sq inches and there is also a warming rack of 156 sq inches. The grill also features a side burner and a cabinet. Its total cooking space is 669 square inches. The Broil King Regal 490 features 500 sq inches of primary cooking area, a Rotisserie Burner and a side burner. The total cooking space is 695 Square Inches. Exceptional Material And Sturdiness – Genesis have demonstrated quality construction throughout this grill which almost everything on it is made of high grade stainless steel grill. As compared to the stainless steel used in constructing Broil King, it is a little better. Solid Durable Structure – Broil king have had a good reputation in the industry which dates back decades. The grill is also made of stainless steel that has stood the test of time and proven to be reliable in terms of durability. Although it is not as sturdy as the Weber grade, it still is solid enough and nothing to worry about. Weber Genesis II LX S-340 carries the legacy of the brand with it and with its 3 burners it has an hourly BTU of 43,500 and side burners with 12,000 BTUs. Genesis employs their unique and high performance GS4 grilling system to ensure an even and consistent grilling experience through its 3 burners, side burner and warming rack. Broil King Regal 490 has 4 burners with a BTU of 50,000 on main burners, 10,000 BTU on Side Burner and 15,000 BTU on the rear rotisserie burner. Broil king which has more BTU rating than the Weber LX S-340, is well distributed on the 4 burners, side burner and rotisserie burner. The downside here is that it doesn’t have a warming rack like the Weber does. This Weber Grill has an amazing temperature control system. Monitoring the temperature can be done using Bluetooth while the unique High+ feature allows for instant heat boost anywhere on the grates. The precision that the Broil King Regal grill offers is excellent. Although there aren’t many adjustments and sophistication like with the case of Weber, it is still excellent and dependable. Infinity Ignition – This feature allows for seamless ignition and starting the burner with just the turn of a knob. iGrill 3 Ready- Allows for total control and monitoring through Bluetooth technology so that you can check and monitor temperature from stat to finish. You can keep track of the temperature and fuel tank level from your phone. Tuck-Away warming rack– This compartment allows the food to stay warm while you cook and prepare the rest. It can also be conveniently folded down when i is not in use. Flav-R-Wave – It is a unique cooking system that allows instant vaporization of drippings to infuse the flavor back into the food. Linear-Flow burner valves – The valve has 180º Sensi-Touch control knobs which gives users total control of temperature settings. Whether you are searing, roasting or slow cooking, this is a feature you will love. Slide-Out tank holder – changing the gas tank couldn’t be easier with this standard regal convenient pull out drawer. This Weber grill boast a very high customer rating from the many online stores that we combed through. It has a rating of 4.4 stars out of a maximum of 5. It has also sold more grill units as compared to Broil King Regal 490. Users applaud this grill mostly for its high performance, ease of use, convenient controls and even heat distribution. From almost a dozen online retail stores we analyzed, Broil King had a decent rating that garnered a 4.2 star rating out of a maximum of 5. Among the things that most users love in this Broil King grill includes the high performance, large grilling area, falvorizing and ability to produce high heat when needed. To wrap it up on large grills, the Weber Genesis Weber Genesis II LX S-340 is the better grill if you are looking for superior quality, performance and even heat distribution. It is also cheaper as compared to the Broil King Regal. 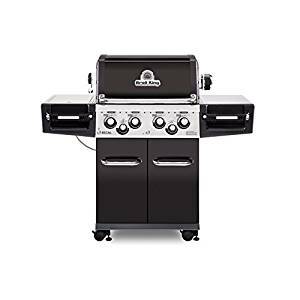 However, if you don’t mind spending the few hundred bucks on top, Broil King’s Regal 490 offers you larger grilling space area and better flavorizing on some foods. They are both under $700. The Weber Genesis E-310 comes with 3 burners which have a total of 529 Square inches of cooking space. It also has porcelain cooking grates and has the capacity to easily prepare food for 5 to 7 people. It is considerably smaller than Broil King’s cooking surface area. The Broil King Baron 440 comes with 4 dual tube burners that are very powerful and produce a lot of heat. The total cooking surface area is 644-sq which includes 444 sq. inches of primary cooking space. As compared to its competitor, the Weber E-310, this one wins in cooking area. Below are the links to check out the deals on each of these two medium sized grills. Sometimes we just need a good grill, either due to the budget or when you need a grill to easily move around or when you don’t do a lot of grilling. To compare Broil King and Weber’s small size grills, there are two grills which you should consider. Comparing the overall performance of the grills from the two brands, Weber has the upper hand and tends to enjoy high customer satisfaction than Broil King grills. Here is a comparison of their best performing grills side by side (comparing grills that are of the same caliber). BTUs – BTU (British Thermal Unit) is a term used in measure of energy used in grills. It translates to the fuel consumption of a grill. Higher BTUs doesn’t necessarily mean that you are getting a better grill. When choosing the perfect grill, it is always recommended to pick one that has between 80 – 100 BTUs per square inch as this a good energy efficiency range. However grills that use TRU-Infrared need less and a range of 60 to 80 BTUs per square inch is perfect.